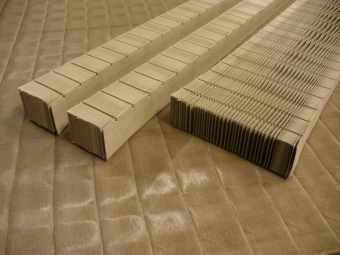 Honicel Blocks are cut-to-size blocks of Honicel paper honeycomb. Honicel Blocks are broadly used as a low-cost core material in the interior doors, partition walls, furniture panels and components for the automotive industry. Honicel Blocks are specified for medium volume manufacturing processes. Honicel Blocks are supplied stacked on pallets and can easily be expanded manually, in order to obtain its optimal hexagonal shape.